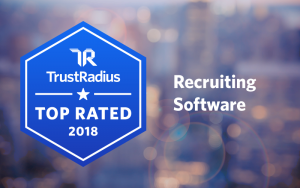 The reviews are in, and PCRecruiter has earned the 2018 Top Rated award for Recruiting Software from TrustRadius. The TrustRadius Top Rated awards are unique in that they are an unbiased reflection of customer sentiment, based solely on user satisfaction scores. In order to earn a Top Rated badge for Recruiting Software, products must be in the top tier of the category with 30 or more reviews and ratings. Every reviewer is verified and every review is vetted before publication to ensure buyers can make truly informed decisions. According to reviewers, PCRecruiter is living up to their promise of being a trusted name in online recruiting and resume management. Usability, reporting and flexibility for a range of business models were commonly cited strengths across PCRecruiter’s 35 reviews and ratings. Read on to see what other users had to say. “I have used PCRecruiter (PCR) for over 15 years. If every vendor that we work with was as good a PCR my life would be a lot better. The functions of the software meet all of our needs; customer service is extraordinary, if you have a suggestion they listen! Main Sequence is honored to be included in this list and to appear among such fine company. To learn more, read this guide on how TrustRadius Top Rated works.